The key difference between the environmental organizations profiled by Discovery is our interpretation of the export flow diagram below, and our definitions of "commodity" and "waste". WR3A, EPA, ISRI, and other respected environmental organizations do not believe that proper recycling is defined as disposal, especially if there is no "release of toxins". Having visited overseas repair and recycling facilities, we long ago followed up on BAN's concerns that parts would be removed and disposed or discarded into the environment. Along the way, we discovered the myth that "tested working" and "fully functional" reduces or avoids the problem. Working goods are regularly upgraded and refurbished. "Big Secret Factories" buy thousands and thousands of "tested working" monitors, and do the same thing to them. 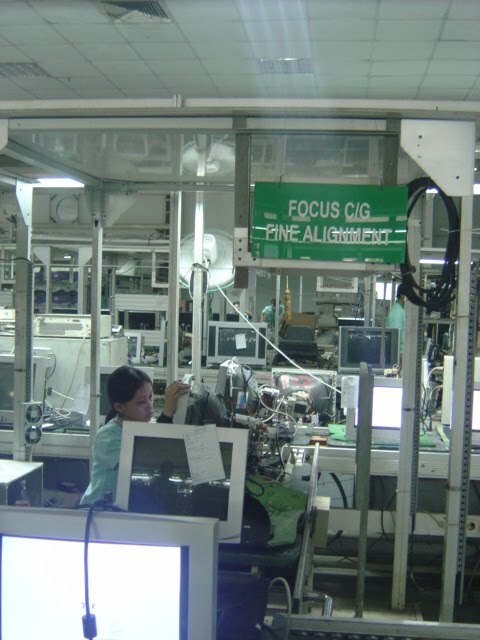 We found most of the contract manufacturing plants (like the one at left in Jakarta) were well capitalized, sophisticated, and capable of proper recycling if given the "fair trade" economic incentives to do so. In fact, one of these factories has become an official take-back program for their home country, recycling monitors for their nation's own schools, homes and offices. WR3A recognizes that the engineers in this factory are far more technically capable ... well... than we are. We want them to bring their sophisticated processes to Mexico, Senegal, and Egypt, which also have good technicians capable of developing the same kind of sophisticated commodity repair and "e-waste" recycling programs. For some reason, BAN appears obsessed with making these factories illegal. They are ignored, outrageously accused of poisoning workers (! ), and represented as "primitive". BAN accuses us of defending them for profit motives, or for misrepresenting the percentage of exports these proper facilities account for (I don't believe the Ghana landfill is burning 5,000 CRT monitors per day, the number this factory repairs). Those attacks on the SKD and contract manufacturing sector, and Jim Puckett's dismissal of the Rajeev Gupta project in India, belie a prejudice or distrust of the export market, period. But in the past year, BAN.org's most frequent response has been a "flow diagram" which they claim demonstrates that sending something which will be repaired, upgraded, refurbished, or properly recycled is illegal. This is despite the Basel Convention's Annex IX explicitly defining these activities as legal. Here is our diagram, which explains the process BAN objects to. Actually 50% are simply repaired without parts removed. This, presumably, is acceptable under Basel Convention, which explicitly defines it as LEGAL, and would not require "tested working". We already have a process we used for buyers (Egypt, Senegal) which did not SKD or rebuild in factories, they did repairs which did not involve any part removal, PERIOD. But BAN still objected to this process and required "tested working" of its E-Stewards. But returning to the processes at the largest refurbishing factories, like those in Indonesia, there are indeed another 50% of units, which are upgraded or repaired, have parts or pieces which would follow the path of the -> properly recycled part. BAN maintains this means a "trans-boundary shipment of waste" occurred. BAN's argument is that if a piece or part is replaced during the repair, and (even if) recycled, that the properly recycled part is waste and violates Annex III. BAN even objects to the factories in Indonesia shipping the parts back to the USA or Japan, saying it was "too late", that the trans-boundary movement had occurred. In obtaining legal import permits for our partners, and recommending them to larger factories that WR3A did not have enough members to supply monitors to, WR3A found that competent authorites overseas are concerned about releases into the environment. They largely consider the removed parts to be domestically generated, since many of them are working parts to begin with and are electively removed (to make an even better unit). Unfortunately, we feel that BAN is on a campaign to accuse these factories of releasing toxins, and by saying they are illegal even if they do everything right, BAN is obviously trying to pick arguments that environmentally benign operations cannot win. This is clearly wrong to begin with, as the Basel Convention defines disposal to mean that something WAS released into the environment. Recycling is NOT "disposal", any more than recycling is "mining". In this diagram, unike WR3A, we do not even KNOW if the part is discarded or released into the environment. The USA E-Steward Exporter merely assumes that the buyer is not going to upgrade it. I have photos of BAN advocate Pledge material sent as working computers, received at a facility in Southeast Asia which upgrades (replacing parts). These were not materials handled by WR3A, which would be covered by non-disclosure or consent... these just happened to be sold to the same people we were selling to. I was at the facility to negotiate the proper recycling of the upgraded parts. According to the Buyer, the Pledge company had never asked about them, they simply declared the export "tested working". WR3A's "fair trade" program, on the other hand, compensates the Buyer for recycling costs, even for tested working items, when they are damaged in shipping or suffer a swing in demand. I am not accusing the BAN Pledge signer of polluting - after all, I was at the same facility, negotiating to make sure they were capable of recycing the repaired or upgraded part in a manner which did not release Annex III toxics into the environment. I am simply describing how working with buyers cooperatively and transparently leads to better solutions than "bans" on export. 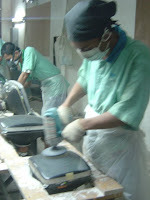 During very high demand, I have seen factories buy from really uncareful exporters, increasing the number of bad units. Ironically, because of the incentives WR3A provided for proper recycling, it's getting harder for us to object to this practice. We would strongly prefer, however, for E-Stewards, R2 certified companies, etc. to fill the demand and benefit financially as well as reduce carbon and wasted shipping. When the factories are declared illegal, per BAN's campaign, R2 Recyclers can no longer export to them. Then you wind up with the "underground" economy in China, where factories still exist but have to buy from people who are willing to smuggle. In Hong Kong, you can actually walk through the front door of a bank and buy "smugglers insurance" against a load being seized, that is the way businesspeople are forced to deal with the threat of a capricious decision by a customs official or sudden change in Party rules. What do you think happens when a savvy Malaysian or Indonesian tech gets a Pentium 4, tested working, with a 128RAM? They replace the RAM with 512 or 1G. The 128 is recycled or discarded. WR3A makes sure it was recycled. BAN says "recycling" is "disposal", but never asks what happens to the "tested working" but "outmoded" part? If you send a completely working 110v power supply to a 220v country? What do you think? BAN's 'process flow' diagram never asks, it assumes "working" means it is sent to a 110v country, therefore there is now power supply recycling. BAN was informed of this in 2006, politely. I am getting less polite this year. If BAN wishes to respond to this blog, as always, we complete post the responses. BAN, on the other hand, posts messages with no response allowed. So we got one hand tied behind our backs. What does BAN say about proper recycling overseas? See Part 2 of "Digital Dumping Ground", the Canadian-PBS Frontline documentary. In minute 7, the documentary visits Rajeev Gupta's sophisticated recycling facility in India, and poses the question, "what if a network of proper recycling facilities was certified, worldwide?" (this is actually WR3A's and R2's goal). Jim Puckett doesn't say it is illegal. He says he doesn't believe people will use it. WR3A makes sure they do.